I’ve often wondered what the ultimate classic Mario title would consist of. 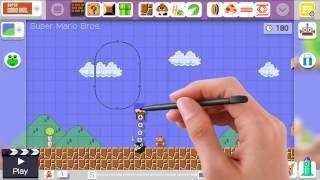 While Super Mario Brothers 3 and Super Mario World arguably still hold that title, Super Mario Maker certainly gives these classics a run for their money, and it manages to do so with very little actual gameplay content made by Nintendo. It offers virtually all that a die-hard Mario fanatic would want in a classic platformer; a nearly infinite amount of content, a nice blend of nostalgia and modern Mario gameplay and, most notably, the ability for the player to take center stage and create their own levels, which they can share with the world. This feature is sure to satisfy many an amateur game designer, creative folks, show-offs, and/or control freaks who prefer their gameplay experiences crafted by their own hand. Not only is the aforementioned feature the biggest appeal and selling point for most, but it is indeed the meat-and-potatoes of this game; which is ironic because the level designer feature doesn’t quite qualify as “gameplay”. And yet, I had an absolute blast sitting back on my gamepad with a stylus in hand, crafting my own Mario concoctions. The level design and creation in surprisingly easy to get used to, thanks in part to the intuitive touch controls on the gamepad screen. The interface provides a clean and relatively simple layout of a basic, randomly generated stage from which you can use as a foundation (or can choose to start from scratch), as well as a palette of tools at your disposal, which are marked by easy to recognize pictures. You can also instantly jump into your stage and give it a test run, further adding to the intuitive and seamless nature of the level creator. Simply put, it just feels “right” . Nintendo further eases the learning curve by rationing out the assets/functions at your disposal, holding back some of the more intricate ones for later. While this trickling out of available content may annoy some of the more impatient folks and those completionists who want everything to play with right out of the gate, I found it did help keep the confusion to a minimum. Still, there are a few quirks here and there that take a little extra time to uncover and to pin down. For instance, the useful ability to drag and select multiple objects for movement or copying is a little tricky to locate within the interface, and even once discovered, can be awkward to use at times. There is also a feature that allows you to grab and shake enemies in order to alter them in some way. While this is a neat little addition, it is easy to forget about, and is not always the most convenient method to use when frequently experimenting and looking to spruce up your level with different enemy varieties. Still, these are more nitpicky aspects that don’t generally hinder what is overall a well crafted and easy-to-learn system. Despite the aforementioned user-friendly interface and simplicity there is still quite a lot to play around with right out of the gate. 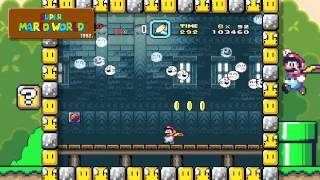 You are initially granted only the New Super Mario and the original Super Mario Brothers themes, though these prove to be more than enough anyway. The more you play around with your levels, and add various assets, the more goodies you will receive - or rather, you will receive them more quickly. In other words, you will still gain access to all the game’s content/features (as they run on a designated schedule), but those who clock more time will speed up this schedule, granting incentive to toy around with this function in greater depth. Even on the offset of the game, this virtual toolbox comes loaded with a variety of enjoyable assets and abilities which can be utilized in seemingly endless ways, making the only real limitation your imagination. Nintendo has pretty much provided you with the ability to make your stage as action-packed and/or frustrating as possible, with massive array of enemies at your disposal. Everything from traditional goombas, troopas, and piranhas, all the way up to the more obscure chain chomps, wigglers, and magikoopas make an appearance. You can even give many enemies wings, make them pop out of pipes, or turn them into giant versions of themselves by simply dragging a mushroom onto them. The selection of powerups and building materials is similarly vast, allowing you to add your own personal flare and create an artistic design and layout that is uniquely yours. Speaking of powerups, there is additionally the Super Mario Maker exclusive “mystery” mushroom, which transforms Mario into a variety of random characters from other Nintendo games. This is where the Amiibo support comes into play, as a player can use a number of different supported Amiibo to create the ability for Mario to turn into anything from Link to Yoshi, and even the inklings from Splatoon. Like many games that support the Amiibo, it comes across as a bit of a tacked on afterthought. Still, it is nonetheless a cool little novelty that helps add a unique flavor to the ever-familiar nostalgic Mario experiences that dominate the game. Another quality that makes the game somewhat unique from the Mario classics it resembles is the ability to mix and match the majority of the assets for any Mario game theme, even if they yet to have been invented for that particular game. This means you can use a thwomp with the Super Mario Bros. 1 overlay, or place a Magikoopa in the Super Mario Bros. 3 style. Factor this in with the ability to create stages using several of the major Mario level themes - even the airships made famous in Super Mario 3 and the ghost houses straight out of Super Mario World, and you can quickly see the endless stream of potential that lies in this seemingly simple level creator. 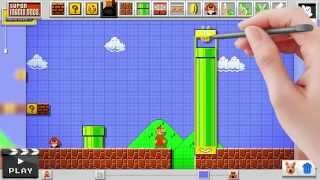 It won’t come as much surprise then, that using this create function can prove to be a pretty time-consuming endeavor if you are at least semi-serious about crafting a level with some depth. Though, I had enjoyed this process so much that time tended to fly by anyway (which may perhaps be a positive or a negative depending on your perspective). One thing that most will agree with, however, is that you a given quite the feeling of satisfaction upon completing your work of gaming art, even if you do notice it is suddenly three hours later than your realized. Indeed - even a small and simplistic stage could eat up a decent chunk of time, particularly when you are still new to the process and finding your bearings. And it is a bit strange to find yourself completing your stage in about 1/20th the time it took you to design it. But still, that aforementioned feeling of satisfaction makes it well worth it, and is only further heightened once you’ve uploaded your level online for all the gaming world to experience. "A Mario platforming haven that lets you create, play, and share"
Super Mario Maker is ranked #145 out of 1434 total reviewed games. It is ranked #9 out of 110 games reviewed in 2015.